Need a Burger? Go to Burgatory. Need an adult (alcoholic) milkshake? Go to Burgatory. But what if you want a mountain of ice cream atop a chocolate chip cookie covered in whip cream? Yep, still Burgatory. I dare anyone out there to indulge in Snooki’s Situation (an italian sausage burger) and still attempt this dessert alone. 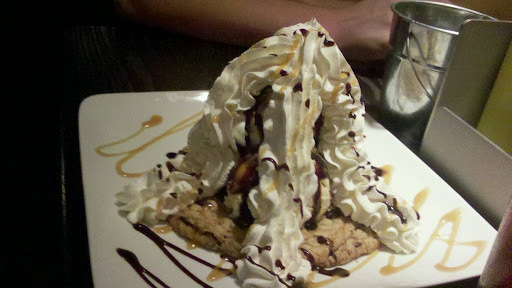 The “Ginormous Chocolate Chip Cookie Sundae” priced at only $5 is a glutinous treat from Burgatory Bar in Aspinwall. The whipped cream was a little obsessive, but for the price, who can complain.Ask for multiple spoons. We did.